Farmers listen on at the Central Plateau DIA winners’ field day last year. 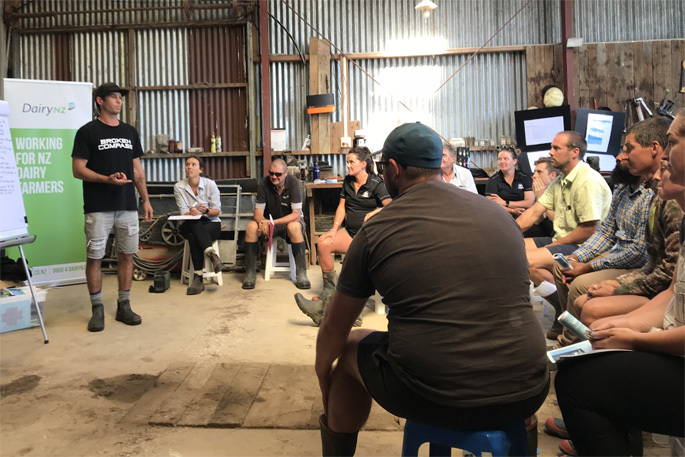 For the 47 entrants in the 2019’s Central Plateau regional competition of the Dairy Industry Awards, just being part of awards programme will boost their career credentials to future employers. That’s what past winners Carlos and Bernice Delos Santos, who won the 2017 Central Plateau Share Farmers of the Year title, believe. “Entrants are all potential leaders of the future,” says Carlos, who with wife Bernice are now regional managers of the Central Plateau regional competition. “A lot of people who have entered the awards in the past have gone on to bigger and better things, and most of them – if not all of them – will credit it to being part of Dairy Industry Awards. Carlos says the awards programme gives entrants a way to boost their credentials. “Farm owners and/or employers look at potential employees’ CVs and if they see they’ve entered the awards, they see them as motivated and willing to improve and get better. Central Plateau is the second-highest amount among the 11 regions participating. Carols says many entrants are based in Reporoa “but we have some as far as Tokoroa, all the way to Mamaku and some as south as Taupo and others in between”. “Our entrants for Dairy Trainee of the Year are mostly newcomers in the industry, so most are in farm assistant roles. “For Dairy Manager of the Year, most are in a senior role on the farm, making decisions that affects farm productivity. A number are working towards becoming dairy managers. The CP regional preliminary judging round for DTOTY is February 14, followed by finals judging on February 25. Carlos says he and Bernice found the judging process exciting. “We had put a lot of hours and effort into making our presentation and when the judging day comes, there’s nothing better than being able to deliver your presentation in the best way possible. But they also advise entrants to enjoy the process. “We know it’s easy for us to say now but looking back, how we managed to put things together is beyond our imagination. “Bernice was pregnant and we had two young kids and a farm to run. This awards programme will get the best out of you. Be yourself, tell the judges your own journey, how you got to where you are and where you want to go. CP regional winners will be announced at a Regional Awards Dinner on March 14, at the Energy Events Centre, Rotorua. Regional winners then go into national judging against winners from 11 other regions, with national winners announced in May.